Italian-born Michelangelo di Lodovico Buonarroti Simoni (1475–1564) was a tormented, prodigiously talented, and God-fearing Renaissance man. His manifold achievements in painting, sculpture, architecture, poetry, and engineering combined body, spirit, and God into visionary masterpieces that changed art history forever. Famed biographer Giorgio Vasari considered him the pinnacle of Renaissance achievement. His peers called him simply “Il Divino” (“the divine one”). 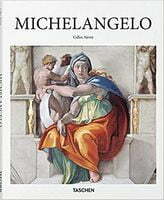 This book provides the essential introduction to Michelangelo with all the awe-inspiring masterpieces and none of the queues and crowds. With vivid illustration and accessible texts, we explore the artist’s extraordinary figuration and celebrated style of terribilità (momentous grandeur), which allowed human and biblical drama to exist in compelling scale and fervor. Through the power hubs of Renaissance Italy, we take in his major commissions and phenomenal capacity for compositional schemes, whether the famous Medici library in Florence, or the extraordinary 500-square-meter ceiling (1508–1512) in the Vatican’s Sistine Chapel. 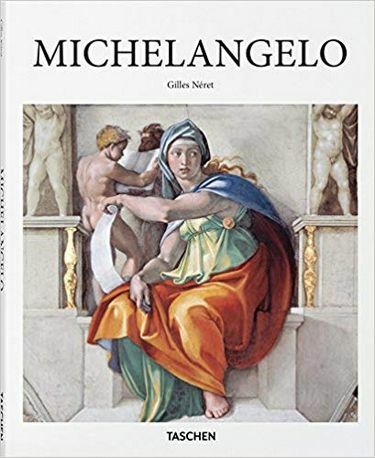 From the towering David to the aching grief and faith of The Pietà and the vivid drama of the Sistine Chapel’s Last Judgment, this is a succinct, dependable reference to a true giant of art history and to some of the most famous artworks in the world.